All the TWC team were enormously saddened to hear about the recent death of local writer, musician and photographer Mark Clemens. Mark was a much loved and valued member of the state’s creative community. Mark’s funeral took place on Monday 6th February and we are honoured to share these beautiful words from Mark’s friend and fellow writer Heather Rose, adapted from the tribute she read in person at the service. I met Mark Clemens when Danielle Wood invited me to give a talk to her post-graduate students in Creative Writing at the university. After my talk, Danielle pointed Mark out to me and told me he had something to ask me. ‘Don’t worry,’ she said, ‘he’s a really lovely man. You’ll like him.’ She was right. That first meeting, Mark asked me if I would be willing to write the forward for a book of photographs he was working on. Unusually for me, I immediately said yes. It was about three days later when it occurred to me, as a shocking afterthought, that Mark might be a terrible photographer. You can imagine how humbled and relieved I felt when the photographs arrived in due time. They are exquisite. 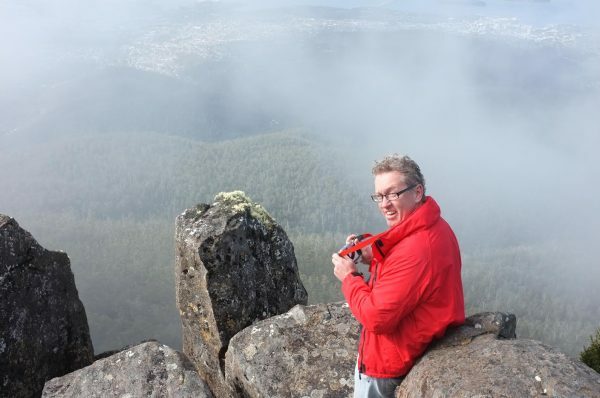 Mark’s legacy follows in the footsteps of Peter Dombrovskis and Olegas Truchanas. So began our friendship and, as with so many people who counted Mark as their friend, it was about words. Mark loved to settle into deep conversations. And in our case, beyond the words we spoke to one another, were the words we wrote and shared. Mark wasn’t an easy writer. Like much of how he did life, he quite liked a struggle. His writing was grappled with, worried over, reworked and reworked again with a level of anguish I’ve rarely seen. Thomas Mann said that a writer is a person for whom writing is more difficult than for everyone else. In that regard Mark was truly a writer. He was never really happy with it. But Mark was a much better writer than he realized. I helped him put a production team together and it would be easy to think the team said yes to me. But in truth they said yes to Mark because Mark had a gift for that. He surrounded himself with good people. His monograph The Mountain was published in 2014. It is largely a book of photographs but includes a beautiful long essay by Mark. The feedback he received on that essay, and the joy he took in that book, encouraged him to embark on the project that he’d had bubbling away for years. A second book of photographs and essays – The Field of Dreams. 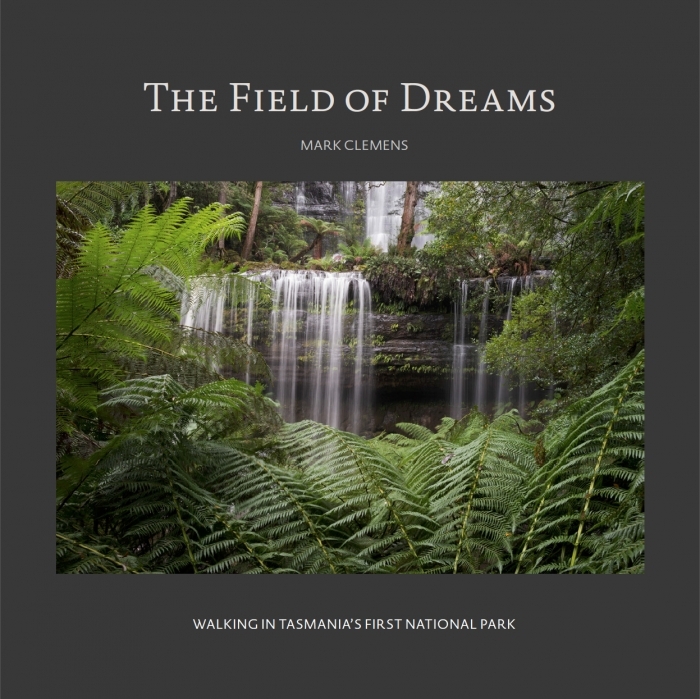 It had been a burning ambition of Mark’s to capture the stories and landscape of Tasmania’s oldest national park – Mt Field. He threw himself into it after The Mountain was published. He was working hard, wrangling and wrestling with every paragraph. When he ground to a standstill, overwhelmed by doubt and fear over his writing, I told him to read Elizabeth Gilbert’s book – Big Magic. And he did. This led, in February last year, to Mark playing a piece of music inspired by the book for Elizabeth Gilbert when she came to Hobart for at TWC event at the Theatre Royal. It was the biggest audience he ever played to. I remember that night before he went on stage at the Theatre Royal. In the midst of his tremendous excitement, he told me how his arms were getting weird tremors, and that sometimes he was having trouble walking. Then suddenly it was April and Mark knew he was dying. Our same brilliant production team – Ian Jeanneret, Petrina Meldrum, Rowan Smith, Malcolm Proctor, Mark’s wife, Janet, and their two adult children Niamh & Tim – all raced to have the book edited, designed, proofed and published. It was an enormous achievement and The Field of Dreams was launched at the State Cinema at the end of August. Mark’s writing in that book is superb. Perhaps the momentum of illness had a clarifying effect. Perhaps he simply let go of worrying quite so much, surrendered, let the words flow from his heart. But it is a love song, that book, of place and experience. It is a gift to us and distant, future generations who might never see the wild, majestic Tasmania that Mark knew so well. And just the day before Mark died, the weekend before last, he signed off on his third book. It is called Small Journeys. It will be released in a few weeks. There are no photographs, only a little book of his last three essays that tell us in the most poignant way of what it was to live and die for Mark. I know for me, these last essays in particular encouraged me to get on with my own collection. I know I will never see the world quite the same way, having known Mark. I will note its beauty, its wonder and its light with a deeper appreciation and a gentler reverence. Of course Mark had plans for essays beyond these – but there simply wasn’t time. Because he couldn’t write – his hands simply couldn’t – I interviewed Mark and together we crafted the very last essay. It is called Taking Flight. Here are a few paragraphs from it that speak to all of us who loved him and, I hope, to those who never had the chance to know him, who didn’t have the good fortune to call him friend, but who might be inspired by his words. Of late, I have noticed the presence of a large eagle hunting and patrolling the air space above our home. An explosion in the feral rabbit population has created easy pickings for the great bird. One year ago I decided to take the wedge tail eagle as my totemic animal and since then I have seen them more and more. This evening it has been flying at great altitude, surveying the grassy paddocks and eucalyptus woodlands. So high is it that not even the ravens, plovers, white cockatoos or noisy mynor birds are aware of its portentous presence. I want to take with me memories of all these things. I wish I had more time. I will miss the wind swaying the trees. I will miss seeing the clouds in the sky. And the waves lapping on beaches. I will miss my children. My family. All my friends. I will miss flowers and plants and especially trees. I was never very good with money. Never bought a house. Only ever owned guitars and cameras. My passions were all wrapped up in those objects. I had so much more to give creatively. I was like the son of Man who had no place to lay his head or to call his own. Instead I found comfort and joy in nature, in creativity, in words, pictures, music. I’m not sure what I know. Once I might have been certain, but not any more. Dying this way is the hardest thing. It’s hard not to wonder what I did wrong. What I might have done right to avoid this fate. I know from where I lie watching my world get smaller, in these final days of disturbing immobility and nights of anguish, living in a body that obeys so few of my commands, human life appears to be consumed by trivia. So much doesn’t matter. What I loved was a sense of deep connection with people. I loved conversations that went into the richest places. And I loved nature. These things have given my life meaning. I am not sure any longer what I think of God, and I have spent a fair bit of my life contemplating that. But I do know for certain that beyond this, beyond this garden, beyond the trees and the sky, the birds and mountains and all the people who are so hard to leave, I will live on in another dimension. And hopefully there, I can fly. Small Journeys by Mark Clemens will be launched in March or April, 2017. Please watch the TWC website for details. There is a crowdfunding campaign in progress to produce a CD of Mark’s instrumental pieces. Heather Rose is the author of seven novels including her latest – The Museum of Modern Love. Heather will be teaching a masterclass on Sunday March 30th as part of the TWC 2017 A Writer’s Journey Program.